As an early backer of the Pebble E-paper Smartwatch on Kickstarter, it looks like I was lucky enough to receive one from the first batches that were created. Yep, mine arrived late last night, though I am just now having a chance to play with it. As you can see from the pictures, I went with the standard black to keep it a bit more classy and timeless. So let’s talk about my first impressions. In the box, you get the Pebble and a USB cable with magnetic tip for charging the watch. That’s it. The only instructions ask that you head over to go.getpebble.com where you’ll find instructions on syncing through the Pebble app on your phone via Bluetooth. It took all of 1 minute to set up, sync, and start testing. The watch itself, is a great size. The first few times I saw the device during the Kickstarter campaign, I thought it might be too small, but now that I have one in hand and on my wrist, I can say that I think they picked a great size. Gone are the days of the ridiculously oversized watch, folks. Pebble clearly understood that. 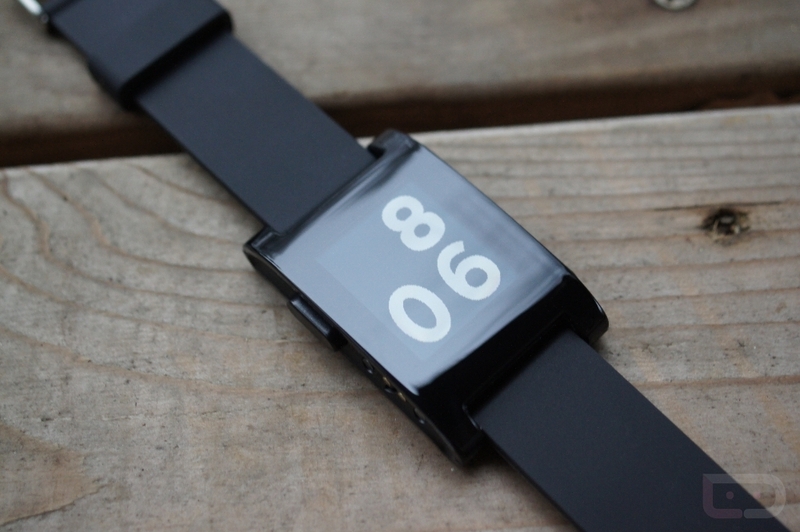 The black version is a polished plastic with matching matte black rubber wrist band. The device itself has four buttons: back, home, up and down. And then there is the charging port, which again, only works with the cable in your box since it magnetically attaches to the watch. In other words, do not lose this thing. 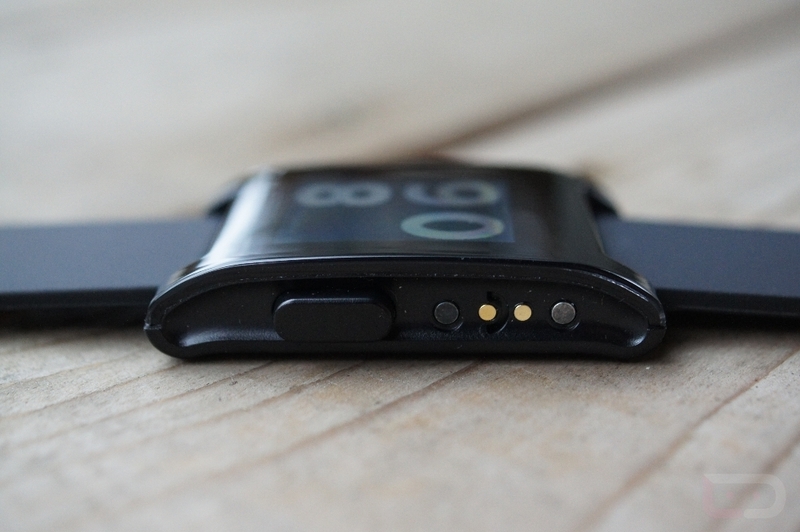 On a software front, the watch does as advertised for the most part. While I have yet to fully sync with my device to start testing emails, texts, calls, the Pebble app allows you to send test messages so you can at least see what notifications would look like. When receiving each, your watch will do a little vibrate in order to notify you. From there, you can view messages, scroll and read them, or decline incoming calls. I can see how this could be handy. At this time, Pebble can accept notifications from Gmail, Email, Google Talk, Google Voice, Calendar, WhatsApp, Incoming Calls, SMS, and Facebook. Unfortunately, the Pebble team still has a ways to go when it comes to other apps. In the campaign on Kickstarter, they showed it tracking workouts such as runs or biking, but those have yet to be built in. It does allow you to control your music, though. On a first impression basis, I’d say that Pebble is off to a good start, but it’ll take some time for me to fully review and decide if you should drop $150 on one, which is the retail price now that it’s out of Kickstarter and on its own. For now check out the gallery and video below.